Spend the day along the old Mississippi River Road, visiting Louisiana’s most famous plantations. See the grandeur and diversity of Oak Alley Plantation, with an upgrade option which includes Whitney Plantation as well! Round Trip pick up service is provided. Explore Oak Alley Plantation, with its picturesque tunnel of live Oak trees, and Whitney Plantation, a memorial to the slave labor of the American south. Oak Alley plantation gets its name from the spectacular quarter mile tunnel of 28 oak trees that frame the driveway as you approach. Built in 1839 and facing the Mississippi River, the magnificent entrance to Oak Alley Plantation makes it a “Must See” destination on everyone’s list of historic Louisiana sites. Thanks to its classic appearance and beautiful restoration, Oak Alley Plantation has been featured in a number of movies and TV series, including the movie “Interview with a Vampire,” and Beyonce’s “Deja Vu” music video. During your tour, you’ll hear from expert guides in period dress, as they recount the factual history of the mansion and immerse you in another time. The tour will bring you through several interior rooms of the plantation, as well as upstairs, where you’ll step outside to take in a breathtaking view of the centuries-old Oak trees and surrounding grounds. After your tour, we’ll give you some time to explore the vast grounds surrounding Oak Alley, which include fascinating exhibits, recreated slave quarters, and of course, countless views of the Oaks themselves that have made this plantation famous. Oak Alley plantation also features a restaurant serving traditional southern fare, ready-made sandwiches and snacks, gift shop, and on-site bar staff ready to whip up a refreshing mint julep. The Whitney Plantation stands out from other attractions by truly paying homage to the slaves responsible for its rise. Take a guided tour of the home itself (“The Big House”), Slave Quarters, Wall of Honor memorial, Antioch Baptist Church, and other exhibits carefully built and preserved in the memory of those who sacrificed their lives for the plantation. The present-day plantation serves as a memorial to the slaves who lost their lives, and the brutal labor responsible for the plantation’s success. Visitors experience a more raw, realistic view of the Old South than many other plantations offer. 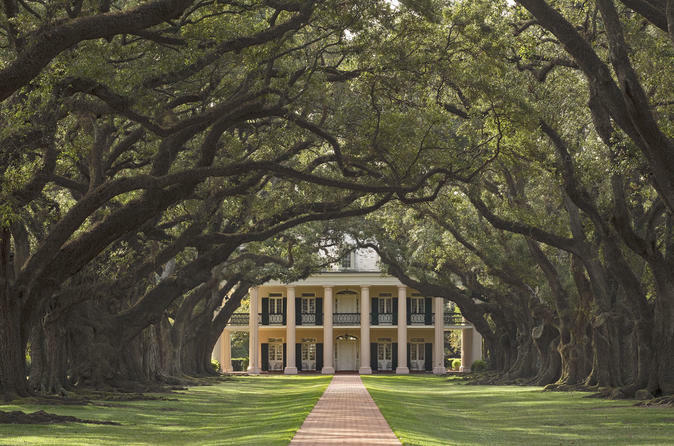 We invite you to explore a plantation like none other in Louisiana. Your tour leaves from 941 Decatur Street in the French Quarter. Please allow 30 minutes for pick-up. Tour is approximately 6.5 hours long (drive included). Tour operates daily with pickup starting at 12:00pm. Please dress for the weather! We recommend cool, comfortable clothing. Be sure to pack a bottle of water and your sunscreen.